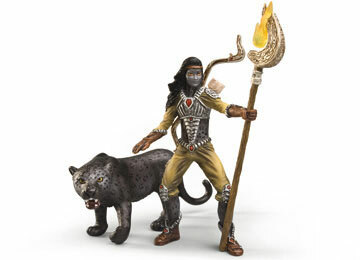 Schleich 70428 - Arelan are made up of two beings, a humanlike figure and an animal companion. Together they form one creature, combining the strengths and character of animal and human in one. Noctis, the panther man is mysterious, fast and powerful, just like a predatory cat. He is the King of the Jungle and soon already a loyal friend of the elves. With his magic torch, he illuminates the night in a flash, then, in the next moment, vanishes again into the darkness. Noctis measures 3.8" x 2.2" x 1.5". Figures are hand-painted.